The first dog must cross the start/finish line before the next dog can cross that line to begin it's lap. In order to avoid losing any time in the pass, dogs are released up to 40 feet before the start line so that they are running at full speed when they pass the other dog as close to the line as possible. Handlers aim for the perfect pass, where the nose of the returning dog crosses the line just before the nose of the next dog. The EJS senses the dogs as they run through the start gate. Depending on the complexity of the EJS, it can time individual dogs or the whole team's run and determine early starts and passes. Most competitions use an EJS, but if one is not available (such as in the early days or at remote competitions), stewards must decide whether starts and passes are legal. In most race meetings, lights like those at the drag races count down to signal the start of a race. If the first dog on either team crosses the start line too early, the judge blows the whistle to stop the race; and that heat is restarted. If the same dog does another false start in the same heat, the heat continues and the first dog must rerun after all other dogs have run. The dog returning from the box must cross the start/finish line before the next dog. If the next dog is too early, this is a break or an early pass, and the offending dog has to rerun after all dogs have run. A swimmer's turn is when the dog gets all four paws up on the box to trigger the pedal and catch the ball, then push off the box to return over the jumps. Triggering the box, catching the ball and pushing off are all done in one smooth motion. The swimmer's turn is understood to be the best way for a dog to turn. 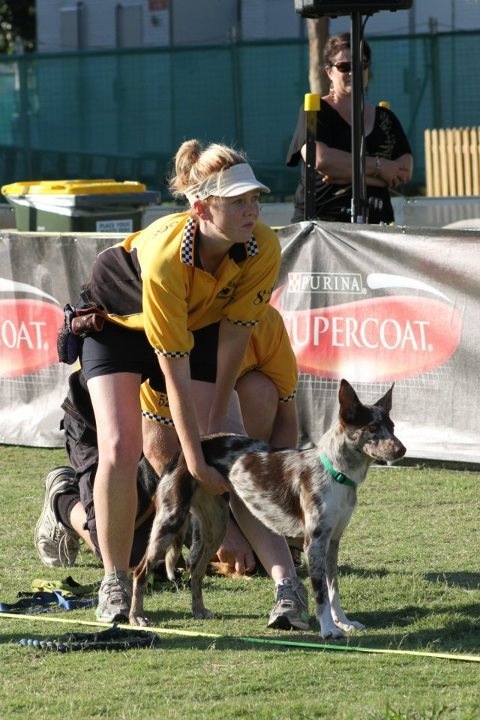 Flyball boxes are often designed to encourage the dog to do a swimmer's turn. A slammer's turn is when the dog runs head-on into the box to trigger the pedal, then has to turn around to return over the jumps. The slammer's turn is thought to put stress on the dog's joints and waste time at the box. When entering a race meet, seeding times will be based on the fastest time recorded by a team during their last three sanctioned competitions. Any time recorded more than 4 months before this date are declared null and void. Seed times are used to split teams into divisions for close competitive racing. The breakout time for a division is set at 1 second lower than the fastest seed time in that division. If a team runs faster than the breakout time, they forfeit the heat. If they breakout three times in one race meeting, they are disqualified from the event. Breakouts are designed to ensure that teams put in realistic seed times to get into the correct division. 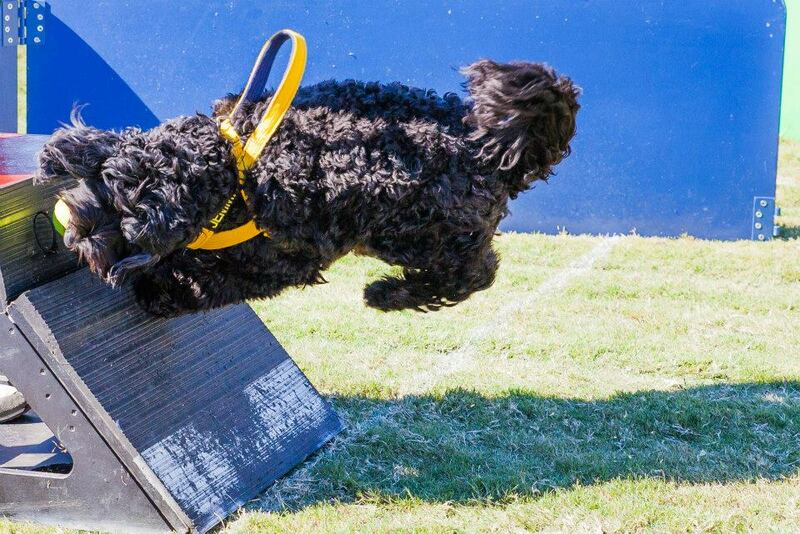 The height of the flyball jumps for each team depends on the height of the smallest dog in that team. At the start of each meet, dogs may be measured. When a dog has raced in competitions for a period of 12 months they are eligible to begin the process of getting a height card. When your height card is approved this will save the handler having to get measured at each meet. Height cards issued by the AFA will be wallet-size laminated cards and will be good for the life of the dog. Once a height card has been issued, additional cards for the same dog may not be applied for. Lost height cards can be replaced with an identical card for $15.00. Height card forms are available on the AFA forms section of this website.